This week, we are focusing on summer fashion that is all about flowing dresses and colours that highlight the essence of the Indian summer. What I love about summer fashion is the chance to keep your attire the way you want it without worrying too much about layers! Think summer, and summer florals, a burst of colours, as well as a flowing outfits often crop up in the mind. A summer fashion trend I love most are bohemian fashion dresses with their flowing structure and styles, almost synonymous with hippie fashion. Bohemian fashion and summer trends make a fine combination if you want to add a touch of attitude to your wardrobe. One of my favourite bohemian fashion brands is Global Desi by Anita Dongre. I feel their collection largely emphasizes a free spirited woman – something I identify with. I love the boldness of the attire that lets you create different looks without losing the essence of the garment or your personality. Summer fashion 2019 is all about the boho-chic look, shorts, long dresses, bright prints, nautical stripes, ruffles and more. 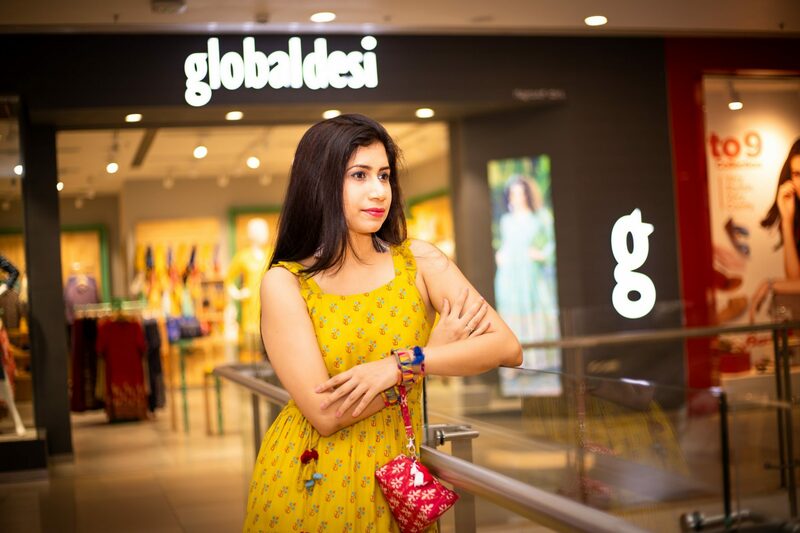 Take a look at the latest from Global Desi. What I’ve chosen: A beautiful Global Desi bright yellow dress mixed with a shade of green with tiny prints all over. It has a twisted cord belt and the sleeveless design is perfect for the heat. I’ve combined it with a red bag that is triangular in shape. It’s perfect for those who love to add a sense of quirk to their summer fashion style. The bag is perfect to keep your essentials and I love that it stands out so well against the yellow. I’ve combined with it open-toed footwear also from Global Desi. These are funky, and super cute and they blend so well with the dress. Combine it with large earrings and funky bangles and you are ready to rock! How you can style it: The Global Desi dress is suitable for all occasions if you are used to making heads turn! You can add your touch keeping your makeup low key and get the sun-kissed look. Add a lot of bronzer for your highlights. Makeup can be neutral with an emphasis on bold lips. You can opt for wavy hair with bandannas to create drama for the look. What do I love about the look? Well, comfort is the key and this dress is comfortable and suitable for the hot Indian weather. Have you added this summer fashion trend to your wardrobe? Hop over to RMZ Galleria, Bangalore to grab this design. They have an amazing collection for every woman who is looking for the latest in summer fashion trends.